AGW Skepticism is having to dig deep. Sure, this year might well see record high global temperatures, but that doesn't mean anything, because future years are bound to be lower. In other words, we've now reached a point where data does not mean as much as does guesses about the future. That is to say, there is no proof of AGW. I have had a rough year so far medically speaking -- first the spinal compression emergency in February, and then earlier this month I had to have my gallbladder taken out, which included a very bad reaction to a pain medication and a few days in an ICU -- and while I'm worried about falling behind on work, it's also been a useful break from climate science that has offered a chance for a bit of a new perspective. Mostly, the new perspective is not that great. This is really turning into a rotten field. Little attention is being paid to actual science. In a recent email Don Easterbrook of Western Washington University actually tried to tell me that 1934 was the world's warmest year. Of course, by now every third-grader knows this is a US-only conclusion and I'm amazed and just pissed that any scientist would try to claim otherwise. At his talk at the recent climate "conference" bought by the Heartland Institute, Chris Monckton actually said "we are now the consensus." You really have to watch it to believe the level of hubris in his voice. It's funny, but I follow the scientific literature very closely and I have not detected any change whatsoever in the conclusion that man is responsible for most of the warmth in the last few decades. It is also somewhat infuriating, but mostly comical, watching Anthony Watts and his accolytes. Just a few short weeks ago they were telling us all how the level of Arctic sea ice extent meant global warming was over. Of course, it meant nothing like that, but now that Arctic extent is decreasing at unprecedented rates they have gotten very busy telling us why this doesn't matter and that in fact it was volume that mattered all along and it's now, in their eyes, increasing rapidly. Except it isn't. Except, of course, this latter result come from a "model" (not a climate model) and therefore it can't be believed. Except when it can. Of course, there are things that mathematics can't ever prove so we can't even really be sure of anything. Here is another of those creepy new robot videos, from USC -- Wimp.com has a narrated version. Here's an interesting site I just learned about: a measure of Arctic sea ice volume over time. 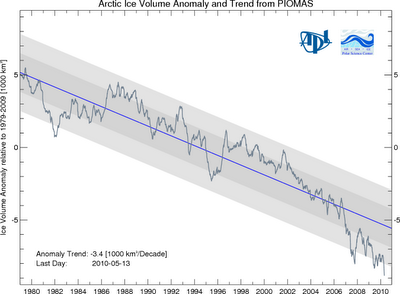 Of course, the true measure of a warming Arctic is sea ice volume, and not extent/area. As this plot shows, it has been decreasing steadily for decades. Measurement of sea ice volumes are much more difficult than measuring sea ice extent. The volume calculation here comes from modelling -- not Global Climate Modeling, but a simpler method of converting known data into volume data. (Prediction: skeptics/deniers will seize on this point in order to dismiss the data). But the model is pretty good, as its validation shows. White House & Congress were briefed; decided not to classify this. admits this technology could be used to create dangerous pathogens, and say it should be controlled by monitoring who is buying the chemicals needed to synthesize. the code for the English words hasn't been revealed; they're hoping someone finds. 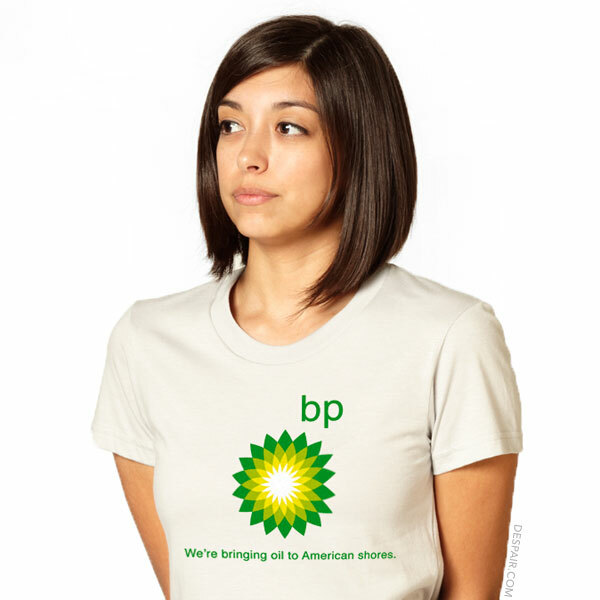 "Designed to be biological neutral." Nature has eight commentaries on this development (manuscript is free). In a commentary in Nature, Arthur Caplan calls this "one of the most important scientific achievements in the history of mankind." Science magazine just lifted their embargo (a day early) on a remarkable story: the first creation of truly artificial life. This ought to create a whole new round of discussion, with a few concerns about the ethics of it all, but I doubt anything in the way of legal restrictions will come of it (as long as they don't use human cells). The ETC Group is, of course, against it. "This is the quintessential Pandora’s box moment - like the splitting of the atom or the cloning of Dolly the sheep. We will all have to deal with the fall-out from this alarming experiment," comments Jim Thomas of the ETC Group. "Synthetic biology is a high-risk profit-driven field, building organisms out of parts that are still poorly understood. (2) We know that lab-created life-forms can escape, become biological weapons, and that their use threatens existing natural biodiversity. Most worrying of all, Craig Venter is handing this powerful technology to the world’s most irresponsible and environmentally damaging industry by partnering with the likes of BP and Exxon to hasten the commercialization of synthetic life-forms." Although high-profile backers of synthetic biology now occupy key positions in the US Obama administration(5) there still remains no proper national or international oversight of new high-risk, technologies that carry vast implications for humanity and the natural world. In 2006, ETC Group joined with other organizations to demand the formal, open and inclusive oversight of synthetic biology(6) and have since called for a global halt on research pending the development of global regulations. ETC Group has reiterated that call at a scientific meeting of the United Nations Convention on Biological Diversity in Nairobi attended by more than 100 governments. Maybe you recall the 2006 Tour de France where Floyd Landis, after cracking on the Alpe de Huez, made an incredible solo breakaway on Stage 17 and ultimately won the race. He was accused of doping and stripped of the win, but strenuously maintained his innocence and denied ever doping, even writing a book titled Positively False: The Real Story of How I Won the Tour de France.I was convinced by his denial and he seemed like a victim of a crazy sport where innocence could not be proven. He just admitted to lying all along. The New York Times: Landis provided detailed information about his own doping practices, saying he consistently used the blood-booster EPO to increase his endurance, testosterone, human growth hormone and blood transfusions. He said he took female hormones and tried insulin once during the years he rode for the Postal Service and Swiss-based Phonak teams, according to ESPN.com. He spent $90,000 a year on his doping regimen, he said. How flat-out depressing. Isn't anybody honest anymore? Wouldn't it have been better to never have won a single bicycle race in your life than go down in history as one of the biggest sports cheaters and liars of all time, even if you weren't caught cheating? I mean, even if you won after cheating, how could you live with yourself? I guess Landis couldn't. At least that's something. If the top line (in orange) were as far below the "average" cluster as it currently is above the cluster, do you not think skeptics would be shouting about it from the rooftops? Of course they would be. And yet no one seems to be pointing these temps out at all -- even the mainstream press. Is it just me? NASA GISS recorded April 2010 as yet another record-breaking month -- the warmest April in their records (which go back to 1880). Not only are the last 12 months the warmest 12-month period in their records, but the last 24 months are the warmest 2-yrs on record. Meanwhile, some people are, incredibly, claiming that we are entering an era of global cooling. Should We Fear Aliens or Not? Stephen Hawking's comment that we should fear extraterrestial aliens has gotten a lot of attention in the last few days. "If aliens ever visit us, I think the outcome would be much as when Christopher Columbus first landed in America, which didn't turn out very well for the Native Americans," he said. I suspect Hawking is almost certainly right. Because, if said aliens are "moral" or if they are not, both positions have important consequences. If they are "moral" like we (humans) think we are moral, then heaven help us. 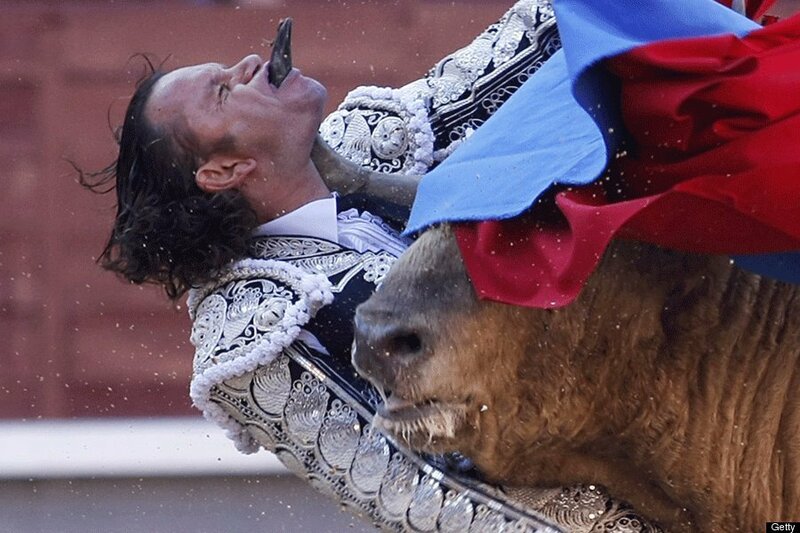 Despite any big talk, the brutal fact is that we humans have no empathy for any species other than ourselves. (Gary Francoine excepted.) Humans will kill anything -- including other humans -- it if serves their immediate needs. Hell, we won't even save our own genetic progeny. How fucked up is a species that won't even save itself? If the aliens are advanced enough to demonstrate some true morality and respect for life, then they will either come here and look upon us as essentially worms (in which case we're toast) or will just leave us alone and never come here at all (the "Prime Directive") point of view. In which case we have no idea any aliens are out there anyway. The chances that they come here with about the same level of morality we have are slim, since we can't get anywhere else right now and frankly it's not clear that we're going to last another 100-200 yrs. If you are into point-scoring.... 2010's Arctic sea ice extent is now below both 2008's and 2009's. . . .
Coming next week: QuarkSoupRadio.com -- interviews (mostly audio, occasionally video) with (mostly) climate scientists on (mostly) current climate news topics. First interview: Dr. Michael Mann, Professor, Director - Earth System Science Center, Pennsylvania State University. The Energy Information Agency just reported that U.S. 2009 carbon dioxide emissions were down 7.0% compared to 2008 -- that's a drop of 405 Mmt. "The large decline in emissions was driven by the economic downturn, combined with an ongoing trend toward a less energy-intensive economy and a decrease in the carbon-intensity of the energy supply," said EIA Administrator Richard Newell. GDP was down -2.4% in 2009. The carbon intensity of the energy supply (carbon dioxide per unit of energy consumed) was down -2.3%. 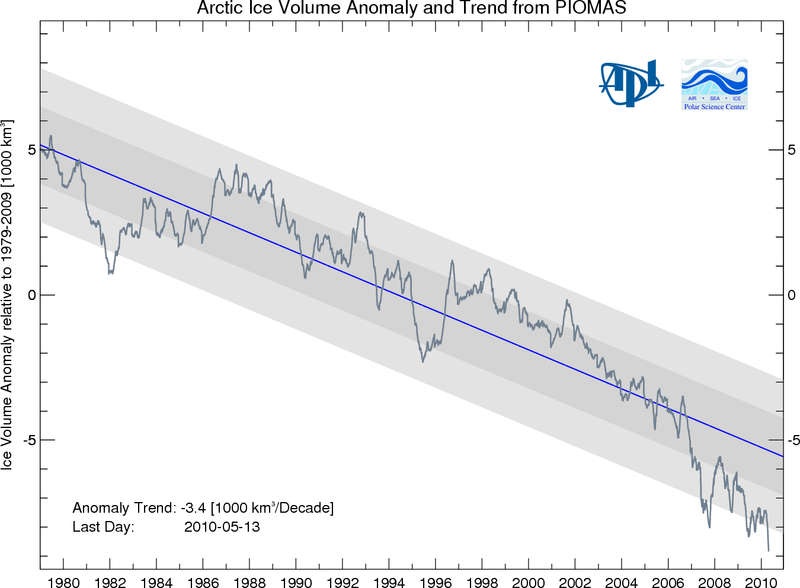 Sea Ice: What Will Denialists Say Now? According to satellite data from the Japanese, Arctic sea ice extent is right now lower than at this same date on 2009. They just never learn... but then, learning isn't really what they're after. Remote Sensing Systems says April 2010 was the second warmest April in their records, +0.546°C above their baseline. That's second only to 1998's huge record of +0.858°C (which was the warmest single month in their 31-year history).